Two players made dinner for 14 people in the downtime. AP kills games for me so thanks John. 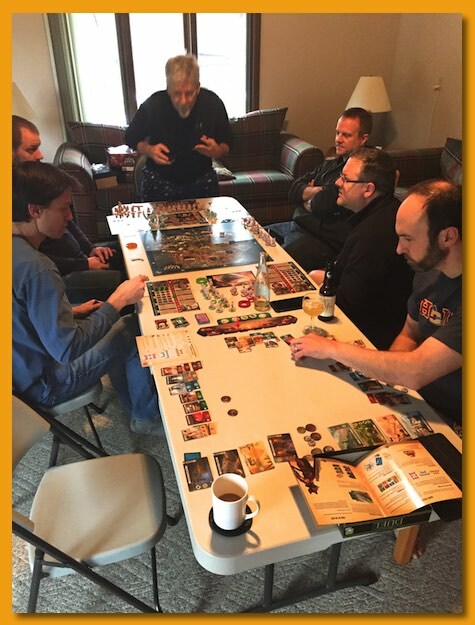 BGG Geek Buddy Analysis to the rescue. Or should I say, Apple-Con! My annual long weekend getaway with my game group is now over and, as usual, I’ve got the post-con blues and can’t wait until next year. Last year, and all previous years, I’ve always booked one of the big “forest” cabins at Lake Hope State Park but this year we moved to a different location. Lake Hope’s cabins are rustic, economical, and meet our needs but one member of the group had an inside scoop to a “cabin” in Apple Valley so we took a chance. I usually book the Lake Hope cabin a year in advance but last year the way the convention fell over MLK day I couldn’t book the 2016 dates until we got back and the big cabins were all gone. So I quickly booked two side-by-side smaller cabins so that we weren’t completely out in the cold. As 2015 progressed I was getting more and more concerned that having two cabins would ruin the close-knit camaraderie that we enjoy when we’re all together. Luckily, the Apple Valley connection came through and in the end, the cabin was nicer (it even has wifi! ), it cost less, and is about 30 minutes closer to Columbus. A win all around in my book. With no strong sentimental reasons to return to Lake Hope, we’re all hoping we can use the Apple Valley connection for years to come. 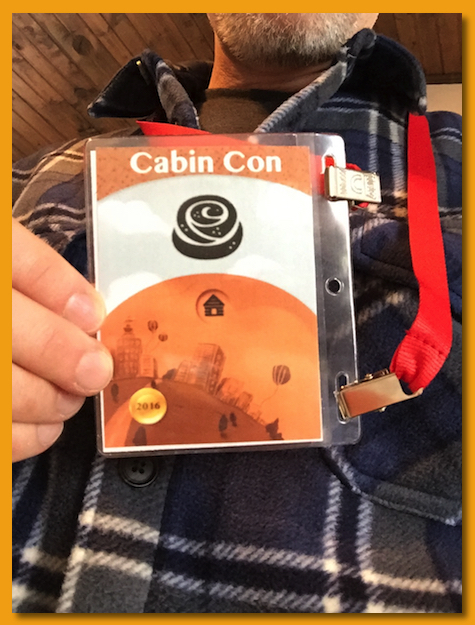 This year I got a bit goofy and generated Machi Koro-based “name tags” for everybody and threw them out on the gaming table. Each person had to locate the one that had the center icon that the most identified with. I made it way too obvious but I had fun making them and enjoyed watching people pick them out. 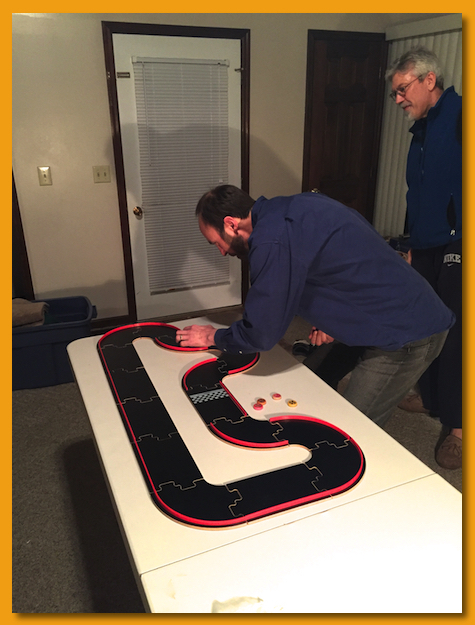 The new cabin had plenty of room in the separate kitchen and after moving some furniture around in the living room we quickly made room for the long gaming table. After all seven of us arrived, we ran through two heats of PitchCar joining the best two from each heat into a final three-lap race. The ultimate goal, initially, was for the winners to get the two beds in the cabin and everyone else would sleep on inflatables but in the end, the snoring club got one room and our connection to the Apple Valley cabin got the other room. Seemed only fair regardless of the outcome of the flick-fest. We all pitch in and sign up for a meal (we have two a day) and attendees bring food to cook and share for everybody else. We all seem to try to outdo each other which isn’t a bad thing in my book. 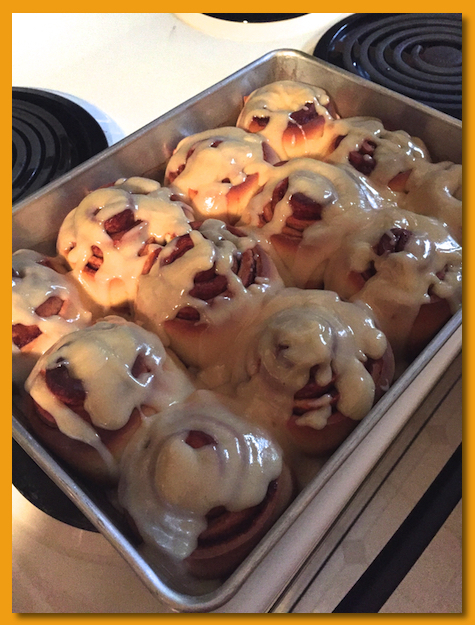 I always try to sign up for the Saturday breakfast/brunch time-slot and always bring a sausage and egg breakfast casserole, spiced fruit, and homemade cinnamon rolls which are always a big hit. 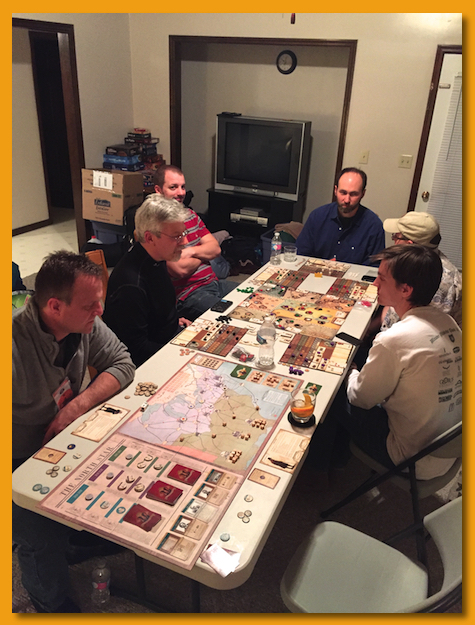 Friday night we split into two groups with one end of the table playing Endeavor and the other playing Freedom: The Underground Railroad. It was my first true two-player playing of Freedom and all I can say is, wow, I don’t see how it’s winnable. We had a really rough time making progress. Over the course of the weekend we would come together for lighter games and split apart for more thinky games but in general I think this year’s con proved to have a lighter mix of games overall. We did tend to talk more between games and simply chat more over snacks, drinks, etc. I used to stress a lot about trying to pack in as many games as possible during the weekend but I’m finding that just letting the gaming happen when it happens is a much more enjoyable experience. I have really found a great group of guys and very much enjoy spending time with them. 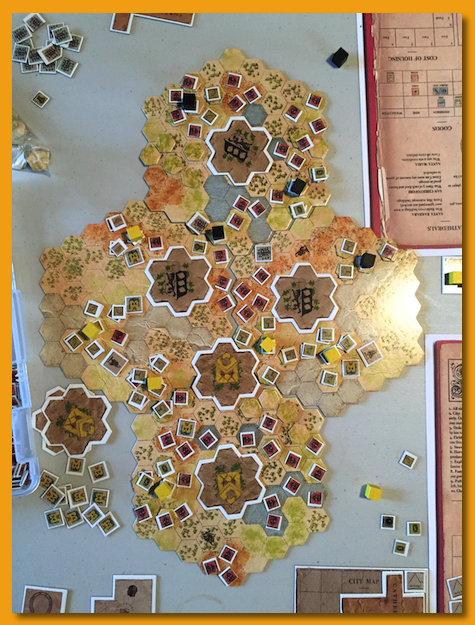 I did, however, have a die-hard compatriot that was willing to take a shot at playing Antiquity with me. We had a lot of fun working through the rules and playing the game right up until we both chose our winning conditions and could rearrange our cities. When that happened, the theme bubble burst, the game turned into a Tetris-puzzle and it was immediately obvious who was going to win and in how many turns. Maybe we got something wrong but it just burst the bubble for both of us. 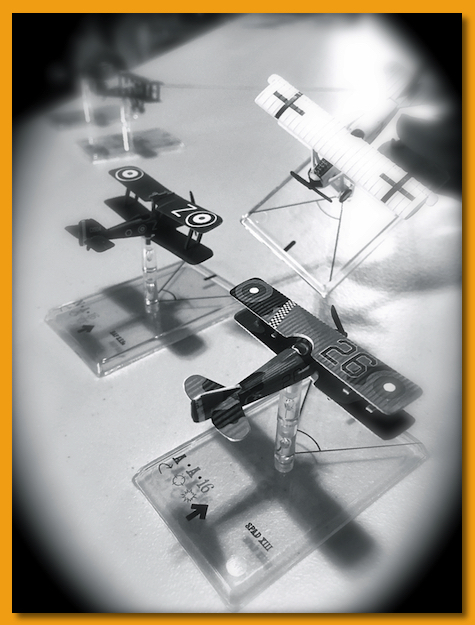 On the lighter side we did play another round of PitchCar as well as two rounds of Wings of War: Famous Aces (one “game” kept us up until about 3am!). What a fun game. We had enough bits for all seven of us and although it was a completely different kind of game than what we’d usually play, we had a blast. I can’t more strongly encourage you to try to find some time to get away with your game group. We’ve found it a great bonding experience for everybody in the group and so far, everyone commits every year and looks forward to it. It takes a bit of work to get it running smoothly initially but once you’ve done it a few years in a row, it almost runs itself. Thanks guys for a great time again. I look forward to next year. After years of neglect I had to do something with the software that ran Marquand.net. It was highly customized by me, hard to upgrade, non-responsive (mobile unfriendly), etc. I spent about 40 hours exporting content, massaging data, running software locally to get everything the way I wanted it (given the time I had), installing new CMS software, and importing content. I dropped most non-board gaming content and removed years of cruft from the server, but I think everything important should be back working again. I suspect I’ll get some rocky reports concerning this or that (probably regarding the online games 🙂 ) but from the way everything turned out, it looks like it was a success. I’m not in love with the theme but it serves its purpose, is low maintenance, and appears responsive. I’m particularly happy with how the games moved over and the dynamic collection/wishlist pages that use the BGG XML API moved over. Don’t hesitate to drop a comment on this post if you see something amiss and I’ll do my best to make things right. I can finally post some items I’ve been holding back until the upgrade was complete. 2 Hours tops. Well, then there’s the rules for 45 minutes, so, yeah, 4 hours TOPS! Very funny stuff. 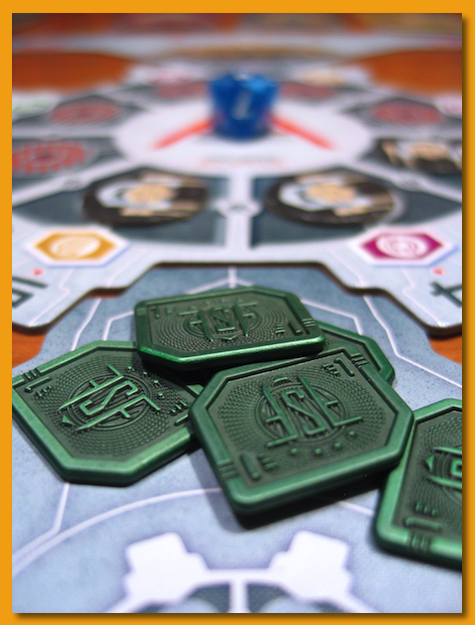 I saw a demo of Far Space Foundry at BGG Con in 2014 and was really taken by the look of it. When it was Kickstarted and we reached the metal credits stretch goal I was excited and anticipated the release. Players take on the role of a freighter pilot and spend half the game taking turns loading raw materials (ore) into their warehouse and then into their waiting freighters. Players get the chance to take extra actions depending on which bay they dock with at Alpha Station. 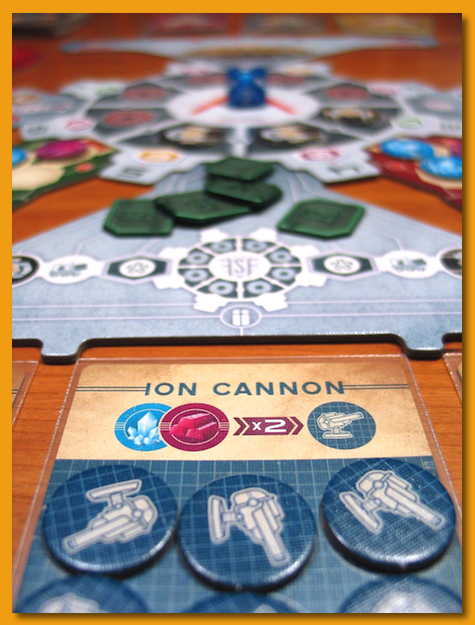 On your turn you play a card from your hand and you make a choice between loading the warehouse or unloading the warehouse into your freighter. For loading you have to find an open bay to land your shuttle full of ore from the two neighboring planets. Your card determines your starting bay but if there is a shuttle already docked you count clockwise until you find an empty bay. They number you reach before finding a free bay represents the number of items you can load. Likewise, when unloading, you must find a docked shuttle and if your card starts your search at an empty bay, you count clockwise until you find a docked shuttle. The number you reach represents the number of items the shuttle can transport to your freighter. How this counting mechanic aligns with the theme is unknown and frankly, a bit confusing. Each bay also gives the player the option of taking a special action to convert ore to credits, add alien pilots to the deck, add a freighter for the alien pilot, upgrade/process ore, etc. but that’s basically the game for the first half. Play a card, count, load/unload goods, and get your freighters as full as possible. Once everyone has played all of their cards, you flip many of the board pieces to represent Beta Station where everyone plays the game again with some slight theme changes. You’re now trying to unload your freighters, convert raw materials to goods, charge goods, upgrade freighters, and then reload your freighters as efficiently as possible. The station’s docking bays have different additional actions but in general, you’re just playing the same mechanic on every turn just like you did during the first half of the game. I really wanted to like FSF. It looks fantastic and those metal credits are really cool and add a nice touch but the game is just simply not my cup of tea. I’ve played it a couple of times and we just couldn’t find the fun in the box.